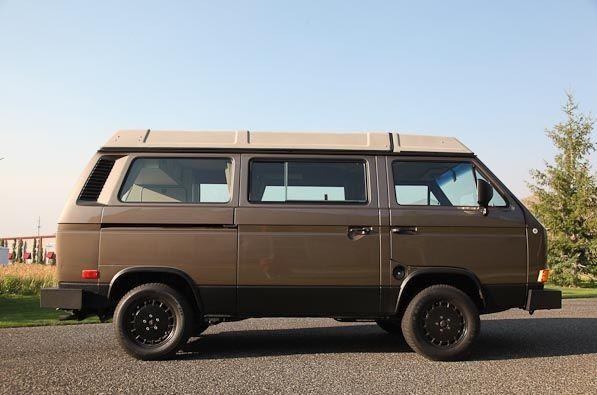 Have you driven a 1985 Volkswagen Vanagon? 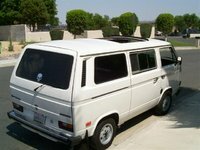 Displaying all 8 1985 Volkswagen Vanagon reviews. The Bird — Love everything overall...great for camping quick get a ways, handles much better with the 15' tires & rims, Monroe gas shocks, although makes for a little rougher ride. I bought it from a VW Mechanic who made it look really nice but found out the hard way that was it, lots of problems, ugh!!!! Pros: Looks great and awesome for camping..
Cons: slow,poor fuel economy,maint. fees high,parts expensive. It's Not Just A Car ; It's A Volkswagen — Vanagons are a brick in the wind yet are suprisingly driveable. the 1.9L boxer 4 is capable of keeping up with traffic at 20 - 22 mpg. build quality is endorsed by quantity of survivors. 2nd & 3rd row seats remove to accomodate so much whatever ! 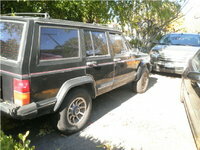 type 2's ARE the original SuV's! pure German form/function rationale. Way To Cool To Sell — Stock photo, mine is light blue. Fun and cool in every way. Like a big box on wheels, no power at all, no air, no radio. Drivers wanted. Pros: cool, smooth, spacious as one could ever hope a car could be, seats are all full size, even the middle, and it is awesome. Cons: wieghs 4400 lbs and has 88 hp. 70 is break neck top speed. My 2nd Brand New Car — 85 HP water boxer 4 speed manual (my last manual car). ROOOOOM - 200 cubic feet. You cannot imagine the stuff I carried in and on this thing. Tan with the Weekender Package (back seat folded flat to make a full size bed). Bought new about $16k out the door. Put over 250,000 miles on this thing. I blew two engines and one trans in the process. But I had a lot of fun doing it. Cub Scouts, Little League, Girl Scouts, Boy Scouts, Band, etc. In addition to many vacations driving all over the western US. It even took a boat ride to Vancouver Island. Rear Wheel Drive No Airbags — I took out the middle seats and cover the holes with a welcome rug. It became lots of fun to surf in off-roading late at night in Riverside, CA. Cons: No airbags, not much up front to protect you. 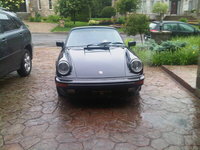 There Are Times When I Wish I Still Had It - — My 2nd Brand New Car - 85 HP water boxer 4 speed manual. ROOOOOM - 200 cubic feet. You cannot imagine the stuff I carried in and on this thing. One time I had it loaded with over 100 wooden folding chairs - all on the INSIDE. Tan with the Weekender Package (back seat folded flat to make a full size bed). Bought new for about $16k out the door. Put over 250,000 miles on this thing. I blew two engines and one trans in the process. But I had a lot of fun doing it. Cub Scouts, Little League, Girl Scouts, Boy Scouts, Band, etc. In addition to many vacations driving all over the western US, it even took a boat ride to Vancouver Island and back. Top speed was about 80mph. I drove this car very hard and that's probably why it broke. The throttle was either not in use or it was usually all the way to floor - unless Judy or the kids were in it. Great family car that holds value and style. Looks/Style Ranked 2000 Chevrolet Astro worse. "History and looks exceeded expectations in person." Back Seats Ranked 2000 Chevrolet Astro worse. "The back seat has far more leg room and storage underneath. " Looking for a Used Vanagon in your area? CarGurus has 24 nationwide Vanagon listings and the tools to find you a great deal.